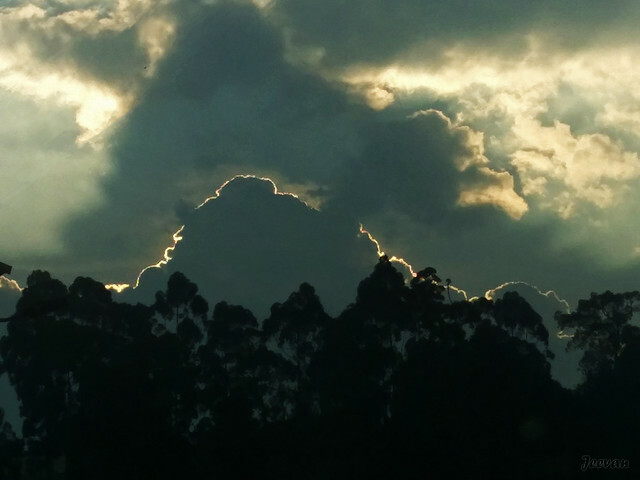 Around Wellington near Coonoor, while stopped to buy some fresh bakery items, the silver lining clouds draw my attention. I found the clouds rising in front of me were impressive with an outline and above the cluster of eucalyptus trees, the clouds form like mountains that caught fire! It was nearly 6 in the evening and clearly sun was behind this magic and once we hit the Ooty-Coonoor main road the sun was out again drawing my attention at many curves performing delight. I could share some more delight from that evening that couldn’t let me put down the mobile, as I was out of camera, I couldn’t capture the best, but enjoyed the views and more to come later. Now that's what I call a silver lining!! Beautiful photo. Absolutely beautiful, stunning, not many words for this capture. Magnificent? Amazing and awesome picture, Jeevan..... WOW!!!!!! Talk about being in the right place at the right time.... You should frame that one. You are really talented at photography. Wowza! What a shot! Fabulous capture! I love the silver outline of the cloud. You were so fast and captured this brilliant shot. So now I know what is the meaning of silver lining on the clouds. That is a special effect with the sunlight just shining over the top edge of the clouds.